Dilston Grove, a former church on the edge of Southwark Park, as a venue for staging art installations, is fantastically evocative A dark cavernous space that conjures up gothic specters, it is an ideal space to explore the metaphysics of light. Mark Ingham’s Ars Magna Lucis et Umbrae showing until 15th June fills the space with jewel-like light projections that directly reference Althanasius Kircher’s (1646) tome on light and shadow. With 100 or more projected images taken from his family album dispersed amongst others exploring the site in which the church stands, a magical homage to childhood memory is created. A fragile interplay of place and time is suspended in spheres of coloured light that point to the question of how far images can be considered local, universal, ideational or concrete. The threshold between light and dark is mediated by the grainy effect of the degrading walls the images are projected on, with flaking paint and gravel protruding into the images to remind the viewer of the real stuff of surfaces. 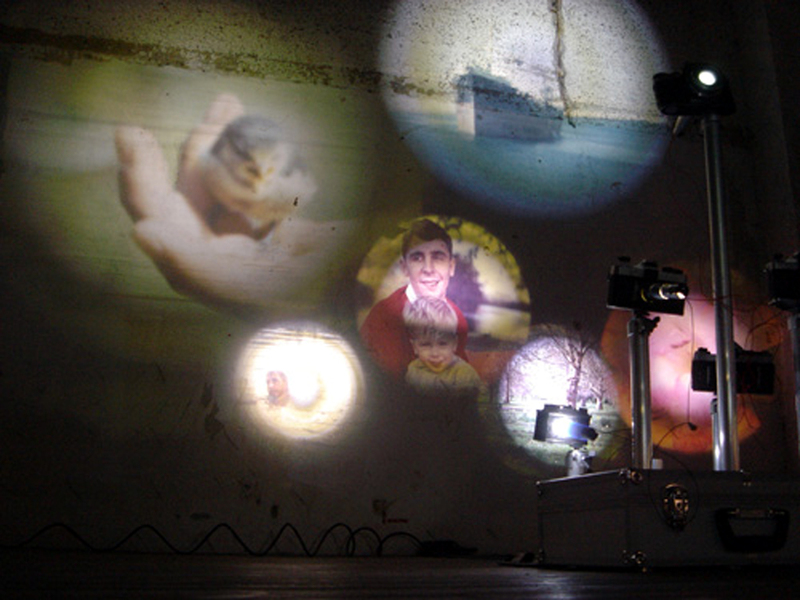 What is interesting about this show is the technology needed to create the projected images. Echoing Kircher’s use of the camera obscura as a kind of technological expression of light, SLR cameras are used instead to evoke the idea of a recording device that captures time as well as light. Kircher’s ‘magic lanterns’ have become time machines that use light to navigate through space. I found it interesting to discover a few years ago while studying psychology, that autistic children are more able to determine what others are thinking, something they normally have difficulty with, if they imagine perceiving them through a camera. The camera acts as a kind of hidden eye for the child. This show also brings to mind the idea in science that any empirically valid result must to some extent reflect the apparatus by which it is tested with; a phenomenon also present in the theory of quantum mechanics, where it is the perceiving apparatus that is thought to collapse the wave function. All of this, while a long way from Kircher’s interest in the camera obscura as an expression of the metaphysical aspects of light and dark, brings to my mind an interest in methodology that avoids being anachronistic. Instead a historical and a more personal lineage run parallel to each other with up to date technology, although not quite digital, but then the importance of the SLR’s role in projecting the same photographs taken years ago is an important aspect of the work. As projection devices the number of cameras needed to create the effect maybe a bit overstated, but, achieve a beautiful decorative patina on the church walls all the same. The juxtaposition and overlaying of images in the mind make up our own personal patina of memories and using transparencies to project such memories for public viewing crosses a liminal threshold between the public and private that perhaps only photography can get away with. It also raises the question of how memory relies on artifacts such as the photograph to reify its existence and vice versa, how the photograph relies on us to project meaning into it. The photograph can be both a hermetically sealed object and a universally vacant image all at once and this dichotomy is heightened by emphasizing its light projected qualities. Projection as a Freudian concept is thought of as a subconscious externalisation of aspects of the self that the personality cannot quite integrate into consciousness. I like the idea that public access to these photographs can mediate a shared sense of loss for histories that are both personal and collectively understood. But it also reminds me that memory, at its most formal, is an aesthetic phenomenon where projected light is etched onto the mind as colour via the spherical shape of the iris, blink and certain aspects of the image are missed and it all disappears in a second. When the camera shutter blinks, however, light is captured and leaves a legacy that can be put to various expressive uses, whether personal, political, philosophical, theological, technological, the list could go on. This show takes a fascinating look at how visual artifacts struggle to transcend time and place and must be considered within a long historical tradition of explorations into light and dark.